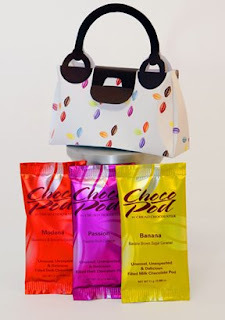 I couldn't help but chuckle when I came across the ChocoPod Purse. According to Chuao (who I love by the way) this is every woman's dream. That is if that woman were dreaming she were still 6 years old and had received this as a birthday party favor. The multi-colored take on Chuao's signature chocolate pod pattern is supposed to be inspired by the much adored Murakami Louis Vuitton collaboration and while I'm all for the marriage of chocolate and fashion, I'm feeling like this will land you on the wost dressed chocolate list. HA HA! @ Coco purse.